Got a case of the storage blues? 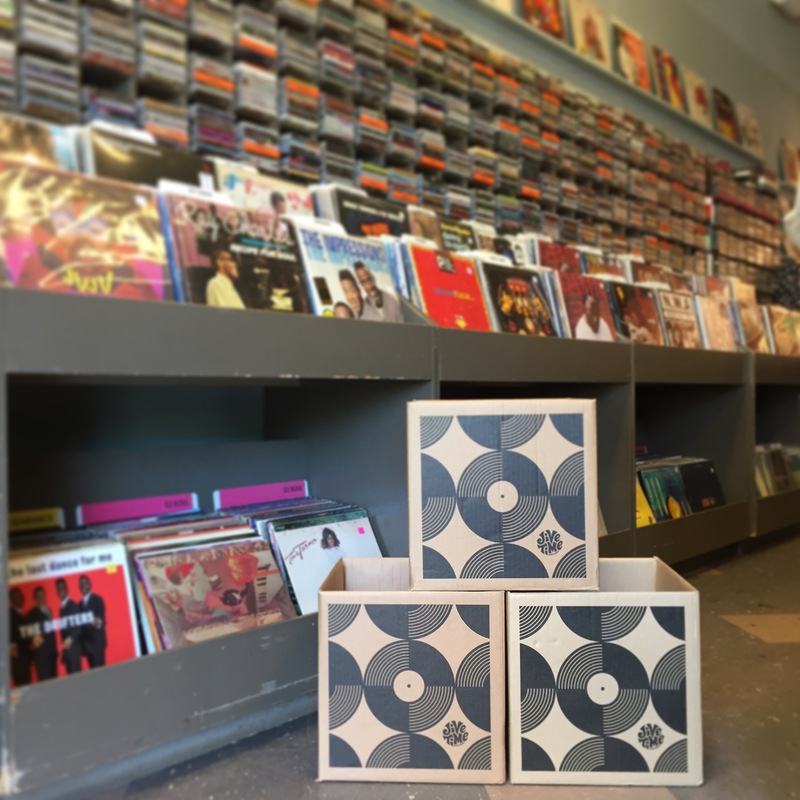 It’s a little known remedy that we retail our Jive Time boxes. Perfect for LP storage and transport. $2.49 each. Comfortably fits 80 LPs. 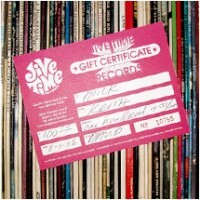 Win the hearts of your favorite vinyl junkie with a Jive Time gift certificate. Our certificates are available in any amount and available to purchase in our store, online, or order by phone at (206) 632-5483. Holiday special! Purchase a $50 (or more) gift certificate and we’ll throw in one of the following: a free Jive Time T-Shirt, Canvas Tote Bag, or a 4oz bottle of our Groove Solution Record Cleaner to present with your gift! 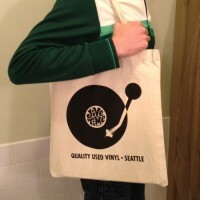 Reusable Jive Time Records record bags have arrived! They’re made of natural cotton canvas with a strap and feature our Space Needle tone-arm design silk-screened in black. 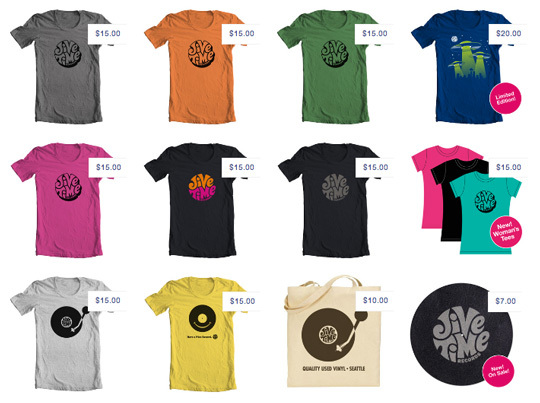 Now you can shop for records, look super stylish doing it, all while saving the environment! They’re available at the store now for only $9.99 (or spend $100.00 or more on merchandise and get a bag for free!) For those of you out of town, we’ll have them up on our web store soon! 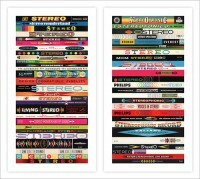 This design, inspired by the graphics in our gallery Groove is in the Art, was originally created for our Tenth Anniversary. We’ve since removed our logo and made this popular design available in multiple colors, finishes and sizes in our Red Bubble store! 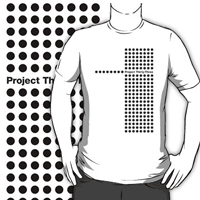 Project Thirty-Three Tees and Hoodies have arrived! This design was inspired by the circles and dots so prevalent on the album covers featured on our popular blog, Project Thirty-Three. The site showcases our collection of mid-century record sleeves featuring only simple shapes and typography and the brilliant designers that made these objects come to life. 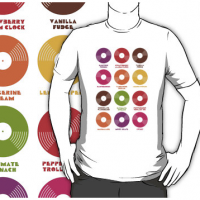 This design features twelve of our favorite rock ’n’ roll flavors including Electric Prunes, Strawberry Alarm Clock, Vanilla Fudge, The Raspberries, Tangerine Dream, The Lemon Pipers, Chocolate Watchband, Ultimate Spinach, The Peppermint Trolly Co., Marmalade, Moby Grape, and Sweet! Our Flower Power poster (already available as a silk-screened print) is now available in multiple colors, finishes and sizes in our Red Bubble store! Lick Our Decals Off, Baby! At last! 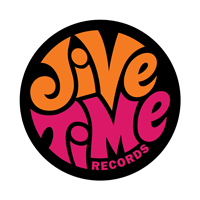 Jive Time logo stickers are here! 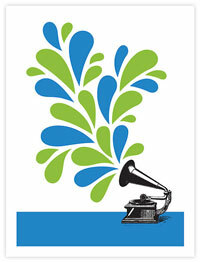 Slap one of these puppies on your car bumper, snow board or guitar case and everyone will know you have great taste in music (and record stores). Our stickers are printed on quality vinyl with a glossy protective layer and measure 4″ in diameter. 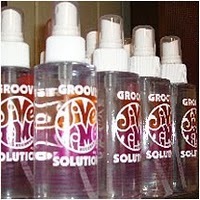 Best of all, they’re FREE with purchase at Jive Time – just ask! Update: For those of you in other parts of the country, you can now order a Jive Time sticker/button combo in our new online merchandise store. 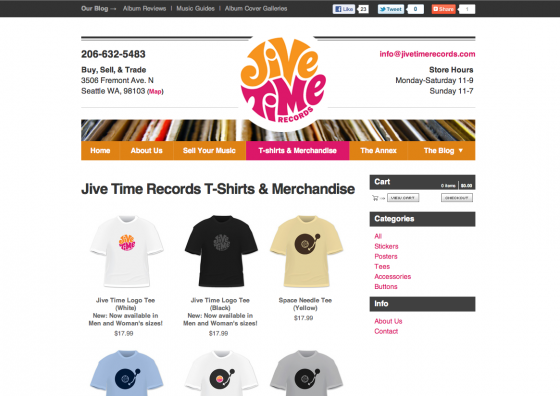 Buy Jive Time Merchandise Online! 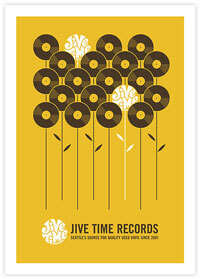 Buy Jive Time T-shirts, posters, record cleaner, and more, including some online exclusives! Visit the store.